The market was opened with a gap up today. Eurodollar is trying to continue its ascending movement, but hasn’t been able to stay above level of 1.2456. This descending movement may be considered as a wave towards level of 1.2360; while moving downwards, the pair may form triangle consolidation pattern. We think, today the price may continue forming this pattern. If later the price breaks it downwards, the current correction may continue; if upwards – Euro may form the third ascending wave. 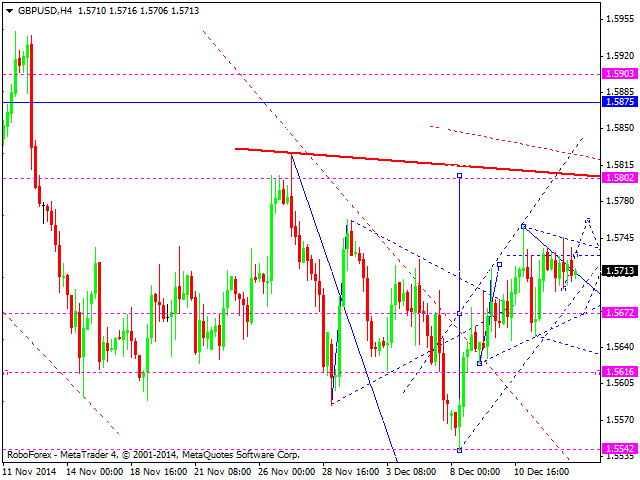 Pound hasn’t been able to break level of 1.5730 and stay above it for a couple of weeks already. It means that we can’t be sure if the pair is going to reach level of 1.5800. This uncertainty may result in a new descending movement and new lows. We think, today the price may continue consolidating at the current levels and try to start a new ascending movement. The market was opened with a gap down today. Franc is trying to continue its descending movement, but hasn’t been able to stay below level of 0.9638. 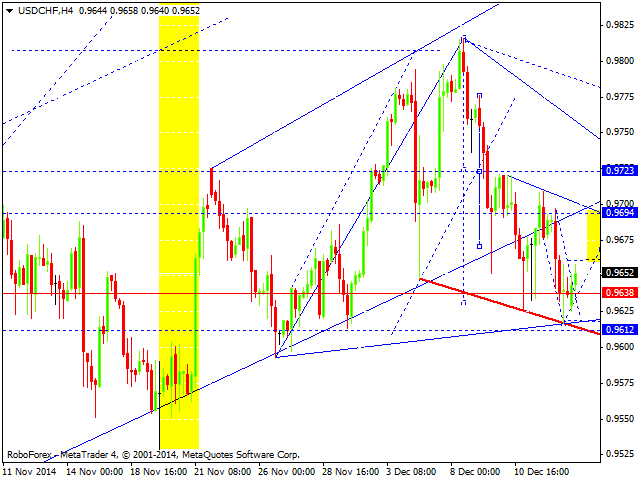 The pair is expected to form a higher correction towards level of 0.9723. 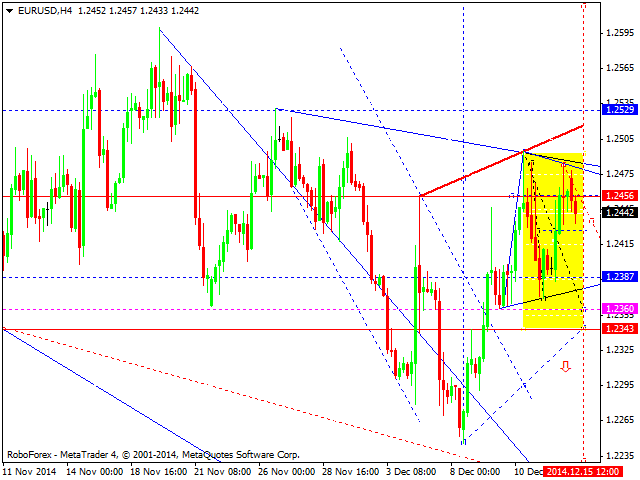 We think, today the price may form triangle consolidation pattern. If later the price breaks it upwards, the pair may form a correction; if downwards – continue falling and forming a descending wave. 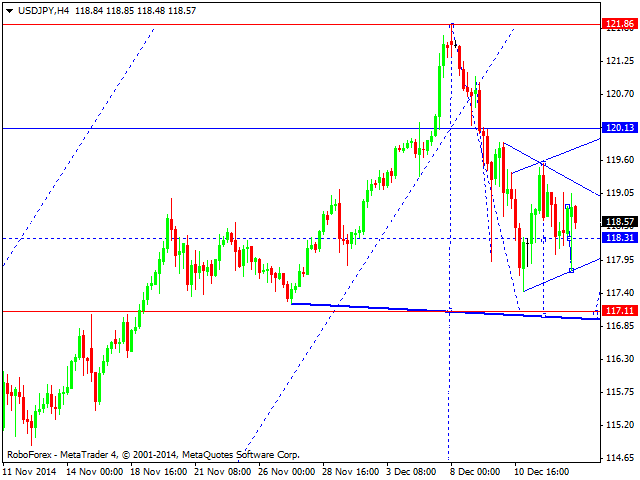 Yen is still forming triangle consolidation pattern. We think, today the price may break it downwards and continue falling towards the target at level of 117.10. However, the pair may break it upwards and reach level of 120.00 (as a correction). After reaching it, the price may fall again towards the above-mentioned target. This descending structure may be extended, thus forming the first wave of the downtrend. 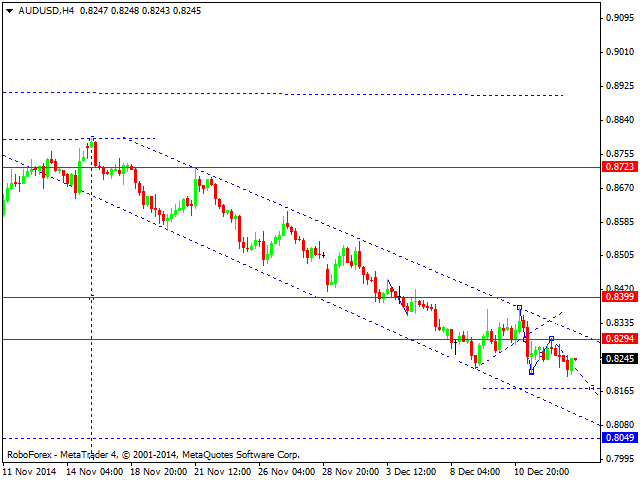 Australian Dollar is still falling inside a descending channel with the target at 0.8500. Any attempt of the price to return to level of 0.8294 may be considered as an opportunity to increase short positions. Ruble wasn’t able to rebound to start a new correction and continued moving upwards. 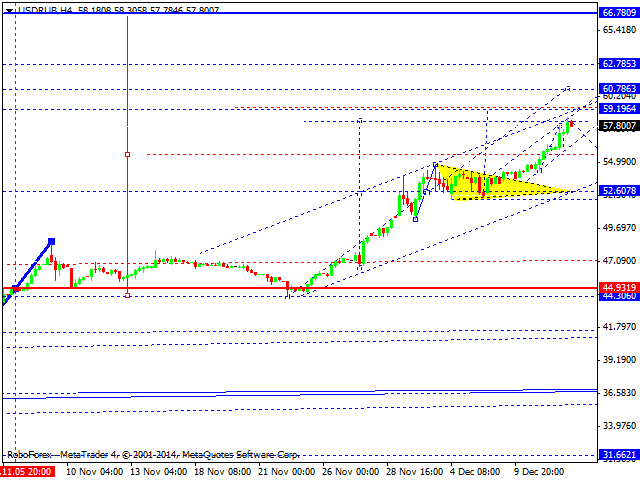 We think, today the price may reach level of 59.19 and then return to level of 54.80. This structure may be considered as an upside continuation pattern towards level of 66.70. 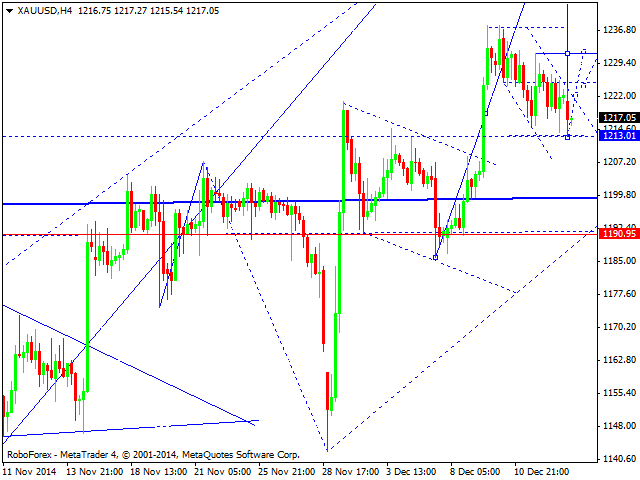 Gold has reached the target of its correction and right now is moving upwards. We think, today the price may form an ascending wave to reach level of 1250 and then start a new correction towards level of 1190.